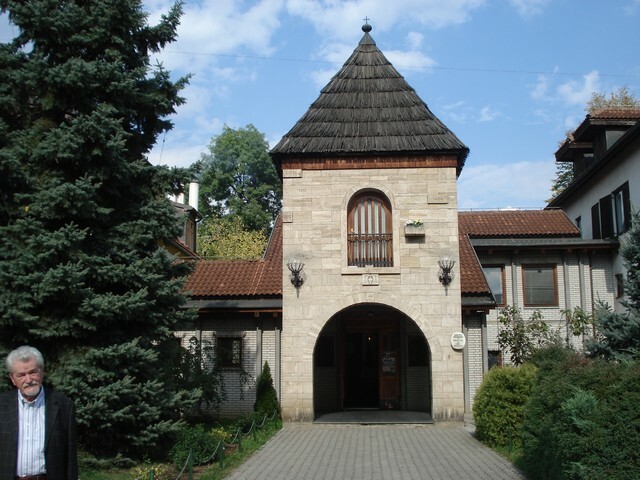 The bishopric seat in Banja Luka. On the left Mr. Stjepan Šulek, Croatian writer, former diplomat and political analyst living in Zagreb. The Banja Luka Cathedral of St. Bonaventura - God's Tent. This wonderful building has been projected in 1960s by Miroslav Matasović, Croatian architect. 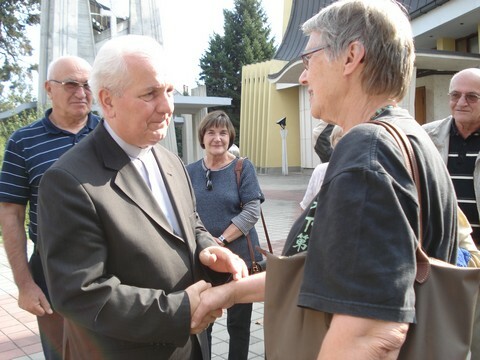 Bishop Franjo Komarica greeting guests arriving from Zagreb. Among visitors was also Astrid Myhre from Norway on the right. On the far left, behind the bishop, is dr. Anđelko Mijatović, Croatian historian and the leader of the excursion. The bishop described the life of Croatians from that part of BiH under local Serbian rule, now scattered throughout the world, as very difficult. Those rare who returned have problems from existential to unsecured basic human rights, despite official proclamations, as witnessed by the bishop. Bishop Franjo Komarica addressing to guests from Zagreb. What did we learn from bishop Dr. Franjo Komarica? Trapists near Banja Luka have founded 5 schools, the study of orthopedy as a part of the School of Medicine, which was later confiscated. there were also Germans, Czechs, Italians, Polish and other). 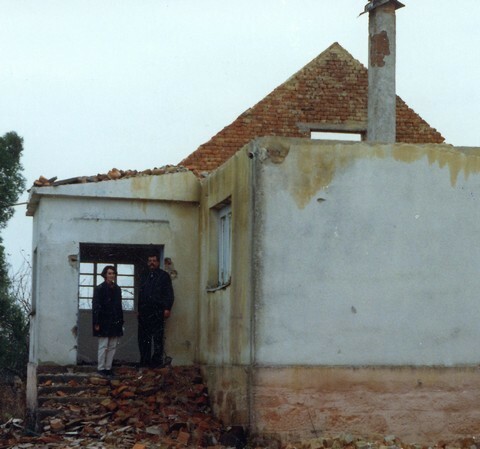 During Serbian military operation in Bosanska Posavina on the north of BiH, about 95% of Catholic churches have been destroyed. According to bishop Dr Franjo Komarica now there are only 6220 Catholics left. One of the previous British amabassadors in Croatia, when bishop Komarica complained to him about the destiny of Croatians in the Banja Luka region, commented as with the following disgraceful words (oral information by the bishop to the group of visitors): "What do you want? It had been predicted that you have to dissappear... How did it come that you are not killed?". Adressing to the bishop, a Belgian official commented with the words that cannot be described as civilised: "You can at best have a stable". This is one of indications in what way the so called "international community" has been involved in "solving" humanitarian problems of Bosnia and Herzegovina. The Croats in Bosnian Posavina, as the bishop concluded, do not have the right to their homeland in Bosnia and Herzegovina. These testimonies described by the bishop show that the responsability of the so called "international community" for tragic events in Bosnia and Herzegovina is enormous. 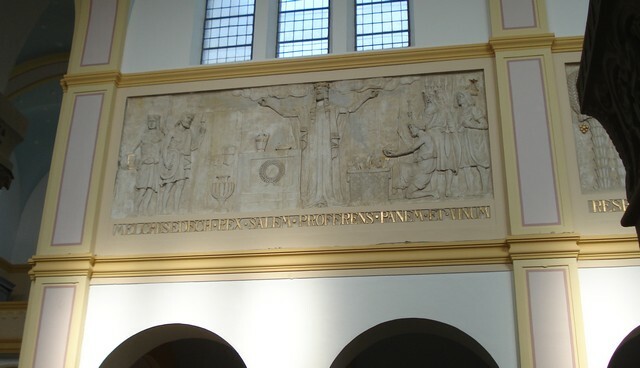 Hans van den Broek, accompanied with 5 of his collaborators, was one among rare those who had the courage to express the following words of repentence: "Excuse me, bishop. Because of my fatal ignorance I had given green light to Milosevic to start the war." of Sava river) 8 Catholic priests have been assasinated (the body of one among them is still not found), as well as several nuns. local rule have forcefuly serbized their names. Dozens of traffic signs bear the inscription of the town called "Srpski Brod" (Serbian Brod), which until 1990s was never called so: the old name was Bosanski Brod (Bosnian Brod). Similar is the case with other towns bearing imposed Serbian names like Dušanovo, Srbinje, which before 1992 had different names. We stress again - this is against the decisions of the Dayton Agreement, and this shows that the Dayton Agreement for the part of BiH under Serbian rule does not exist any more. attend it, and due to decimation of Croatian population in Banja Luka and Bosanska Posavina, the school has more Serbian pupils than Croatian. How the human rights are functioning in the part of BiH under Serbian rule (in the so called Republika Srpska, that is, "Serbian Republic") is illustrated by the following example. 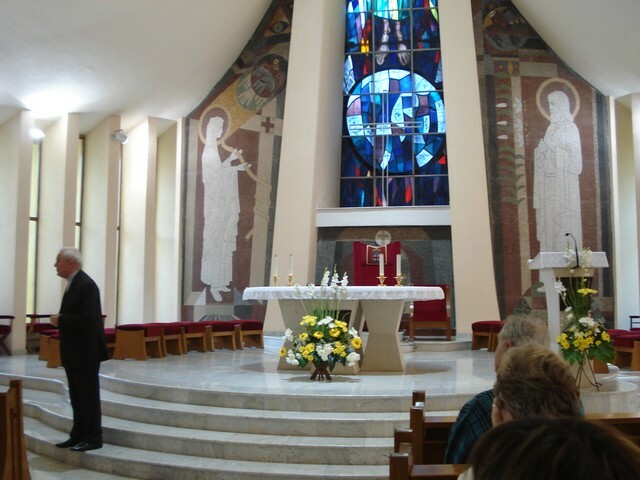 There were breakings into houses of Croatian families even during their visit to a nearby church for the Holy Mass. The intrudors simply occupied the house did not Croatians owners to enter into their own houses any more. It is therefore not then surprising that for example in Austrian capital Vienna only, there are more than 20,000 Croatians from BiH who cannot return to their homes in Bosanska Posavina on the north of their homeland Bosnia and Herzegovina. Is the return of exiled Croatians to their homes in the north of BiH possible? On the right Ivanka Bubalo. The statue of cardinal Alojzije Stepinac at the entrance to the cathedral. 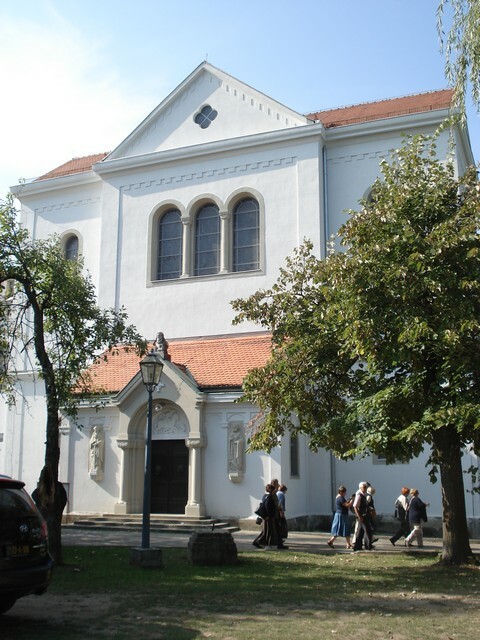 The Cathedral of Banja Luka was consecrated in 2001 by cardinal Vinko Puljić, archbishop of Sarajevo. In 2003 Pope John Paul II payed a visit to Banja Luka in Bosnia and Herzegovina (BiH), spreading his message of hope. It was his second visit to this tormented state. On this occasion he beatified Ivan Merz (1896-1928), Bosnian Croat born in Banja Luka. He had his first apostolic visit to BiH in 1997. Ivanka Bubalo is one among numerous Croatians with difficult destinies in BiH after the events of 1990s. Trapsit Abbey near Banja Luka (in the village of Delibašino polje), renewed after the destructions of 1990s. 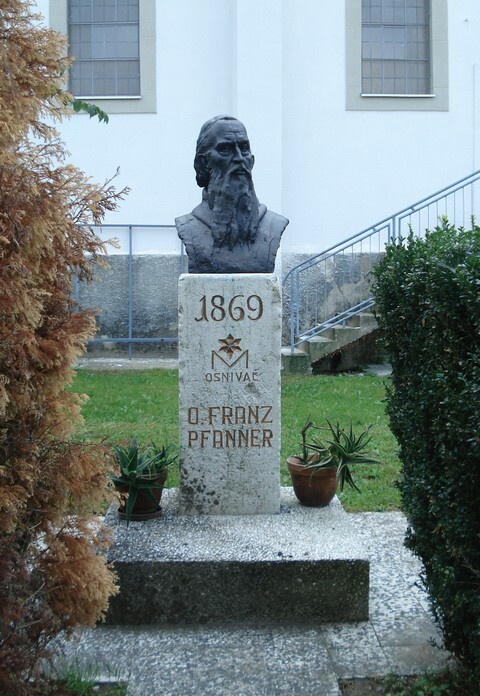 Father Franz Pfanner, a famous Austrian benedictine, founder of the Trapist Abbey near Banja Luka in1869, in time when it was still under the Turkish rule. Before the First World War there were as many as 230 benedictins, mostly Austrians and Germans, but also Hungarians, Dutchmen, Croatians, Italians and Frenchmen. Now (in 2009) it has only 2. The Trappist Abbey was famous for its production of cheese (trappist) and beer. After tragic events in 1990s the production of trappist cheese has been started by the end of 2008. The Abbey has contributed enormously to social and material welbeing of the local population by founding factories (including brewery), schools for boys and girls (for the school for girls the Sisters of Mercy from Zagreb have been invited to Banja Luka), orphanage, hosiptal, houses for workers, by building bridges, a hydro-electric power plant which brought light to the nearby Banja Luka for the first time (before Zagreb! ), etc. Meals for poor people have been distributed on daily basis (for example 400-500 meals daily during the WWI). 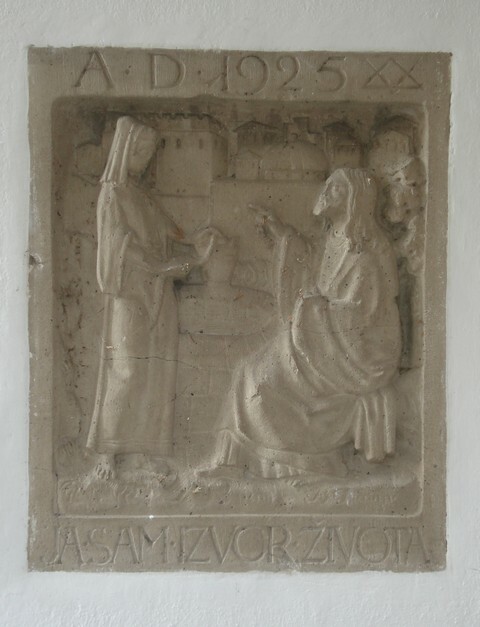 Basic reference: Nikolaus Friedwagner: Marija zvijezda i njezini trapisti, Marienster und seine Trappisten, Banja Luka, 2009. 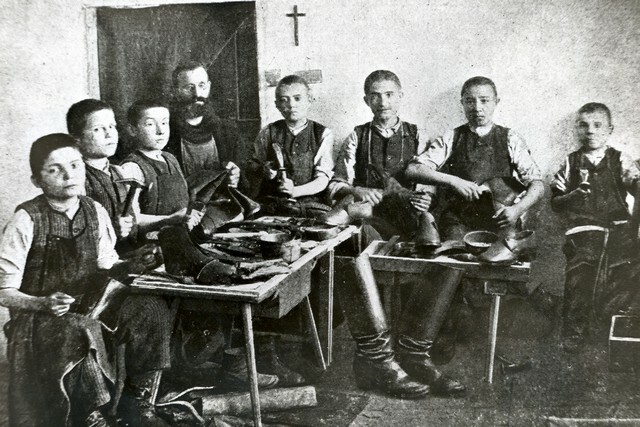 Trapists and their pupils at the beginning of 20th century. A part of graveyard inside the walls of the Trapist Abbey near Banja Luka. 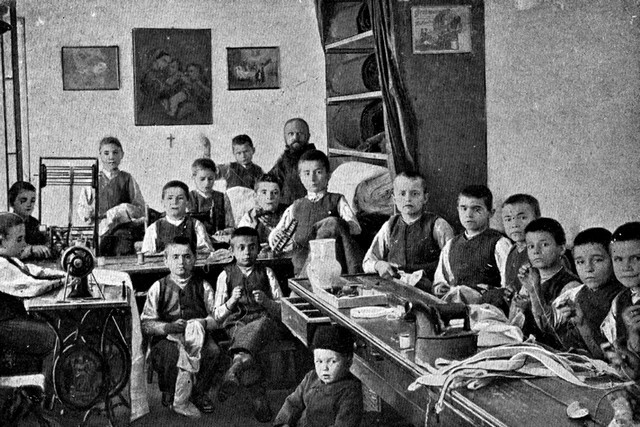 Trapists near Banja Luka and their pupils at the beginning of 20th century. 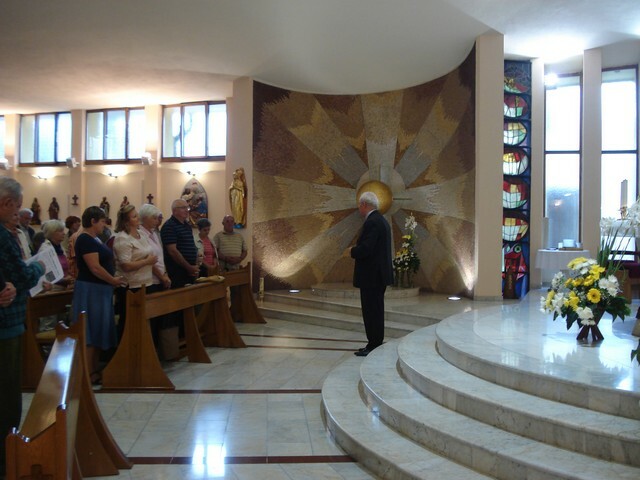 Croatian Mass by Ivo Pervan in the Trapist Abbey near Banja Luka. The society Hrvatska Zena - Croatian Woman (dealing with education, humanitarian and social aid); both photos are from the town of Banja Luka, the second one is from 1938, when a branch of this society was opened. 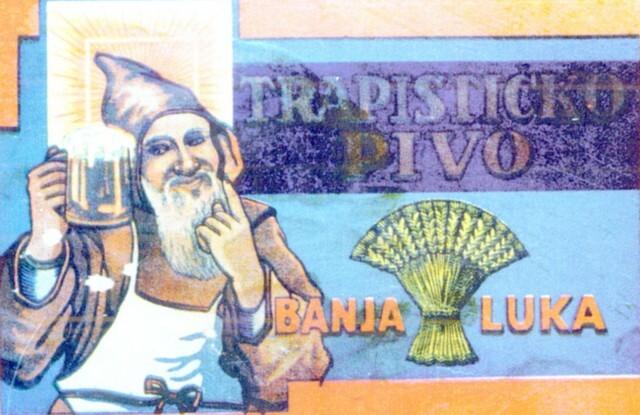 Source Franjo Marić and Anto Orlović: Banjolučka biskupija u riječi i slici od 1881. do 2006., Biskupski ordinarijat Banje Luke 2006. (printed in Croatia). Traces of Serbian violence of 1990s in a Croatian village in Bosnian Posavina, and attempts of return to destroyed and burned homes on the north of BiH. On the photo Ivanka Bubalo. The Rule of St. Benedict, issued in the Trapist Abbey of Mary's Star in 1927. We mention by the way that Benedictins had more than hundred abbeys in Croatia until the end of 12th century! 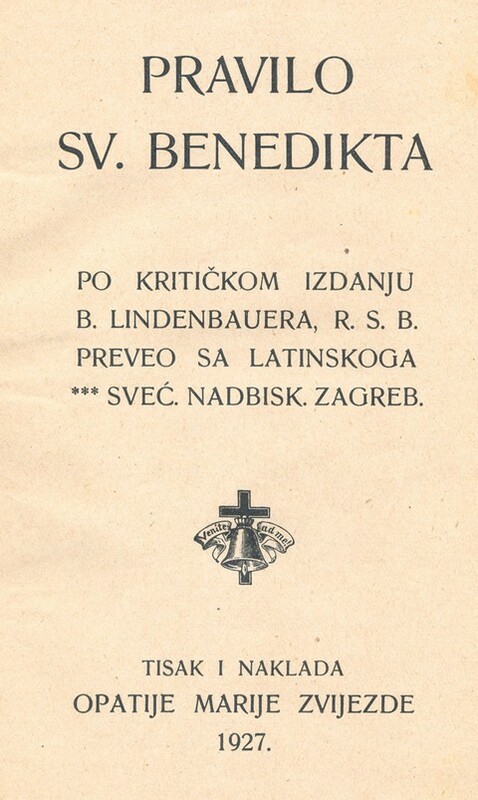 Especially interesting are Glagolitic Benedictins, who used the Croatian Glagolitic Script. 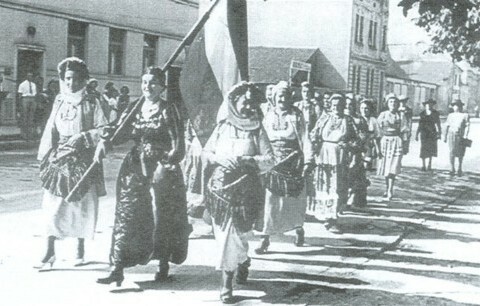 The region of Banja Luka in the western Bosnia has been inhabited with about 80,000 Croats, before the Greater-Serbian aggression on B&H started in October 1991. Since then, 55,000 Croats have been exiled from this area to Croatia, 850 were killed (out of which 450 were killed and massacred in their homes). The reader can easily imagine the meaning of the fact that the Croats that remained in the Banja Luka region under the Serb regime, have to keep the doors of their houses unlocked day and night. 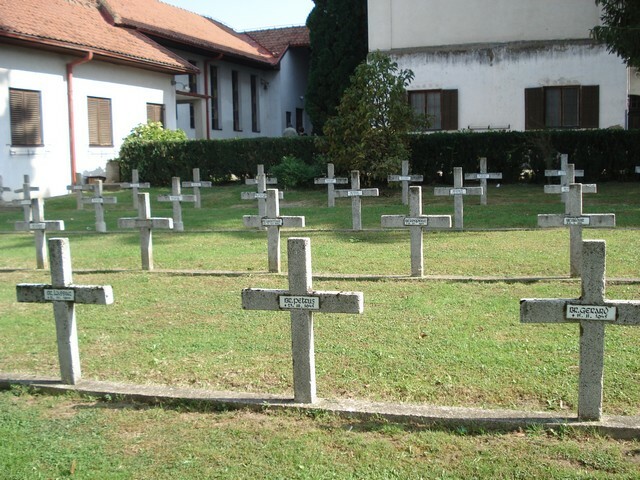 A complete destruction of as many as 80 Catholic churches and friaries (including the Franciscan friary in Banja Luka, destroyed to the ground in May 1995), and many Croatian cultural monuments in the region of Banja Luka alone, prove that the program of this carefully planned aggression was not only the ethnic extinction of the Croats. The program was also to remove any evidence of the presence of the Croats in this area ever in the history, like in other occupied regions. Even the name of Banja Luka originates from a very old Croatian title Ban - Viceroy, known only among the Croats since the earliest period of their history (Banja Luka = Ban's Harbour). 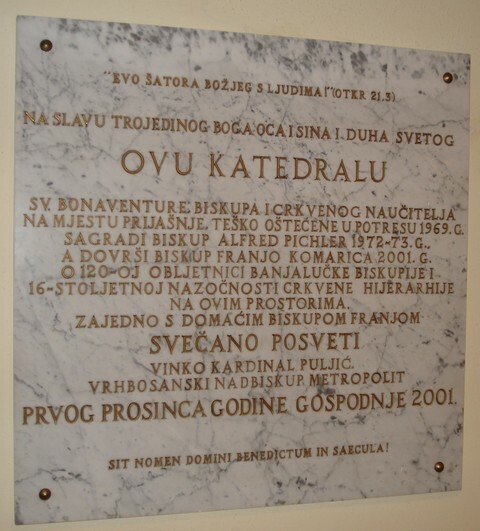 Pope John Paul II visited Bosnia and Herzegovina twice (1997, 2003), and three times Croatia (1994, 1998, 2003). 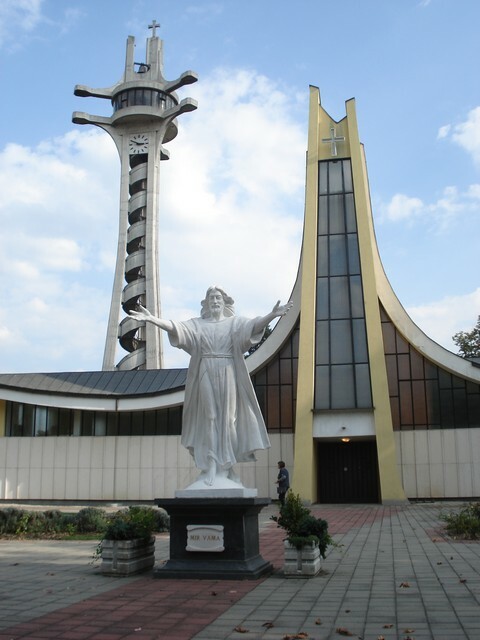 During his apostolic visit to Banja Luka in 2003 he beatified Ivan Merz (1896-1928), Bosnian Croat born in that town. According to information from the monograph by Franjo Marić (Vrhbosanska nadbiskupija početkom III. tisućljeća, Nadbiskupski ordinarijat vrhbosanski, vikarijat za prognanike i izbjeglice, Sarajevo - Zagreb, 2004. 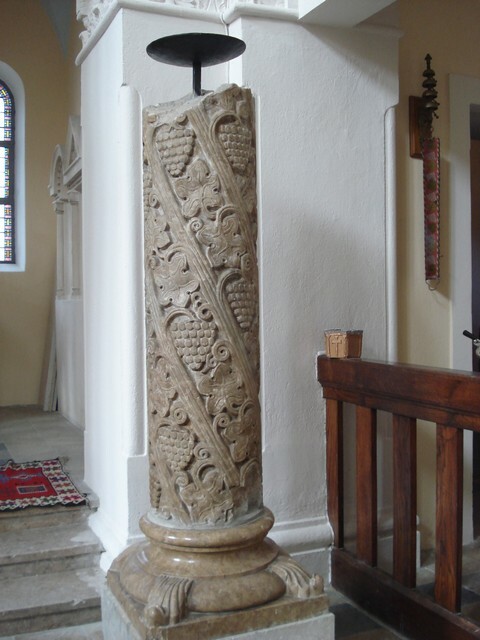 ), the Sarajevo Archbishopric (Vrhbosanska nadbiskupija) in the period of 1992-1995 suffered enormous material losses: 199 sacral objects were completely destroyed, 214 seriously damaged, and 277 damaged. we can also recommend a booklet by the same author The World War II and contemporary Chetniks, Ceres, 1997, presented at the International Conference: Security & Stability in South East Europe, University of Glasgow, January 24-25, 1997 ). As many as 250 destroyed mosques in north-western Bosnia (in the Banja Luka region) illustrate the tragedy of the Muslims in BiH. The table below shows that the number of Croatian Catholics in the parish under the Trapists has dropped from 2750 (in 1973) to just 257 (in 2005). In other words, their number has dropped by more than 90% in just 32 years. If we look at the period of 1991-2005 only, then the number of Croatian Catholic has dropped by 88%. Similar is the case for the whole territory under Serbian local rule in Bosnia and Herzegovina. This testifies to serious problem of human rights of Croatian population in this part of BiH. Župu Marija Zvijezda je utemeljio biskup Alfred Pichler 13. svibnja 1973. diobom od župa Petrićevac i Banja Luka, a povjerena je na upravu trapistima. Ime je dobila po čuvenom trapističkom samostanu, osnovanom 1869. Kao župna crkva služi samostanska crkva čija je gradnja počela 1925., a dovršena je 1929. Teže je oštećena u potresu 1969., ali je obnovljena. Prva samostanska crkva, malo uzvodno uz Vrbas od sadašnje, sagrađena je 1872. Župni stan nalazi se u samostanu o. trapista. To je već treći samostan na istome mjestu; najnoviji je sagrađen 1983. Kućanstvo su još od 1964., uz prekid od dvije godine, zbog izmještanja trapističke zajednice u Kloštar Ivanić 1969. i 1970. do 2005. vodile sestre Klanjateljice Krvi Kristove iz obližnjeg samostana Novi Nazaret u Budžaku. 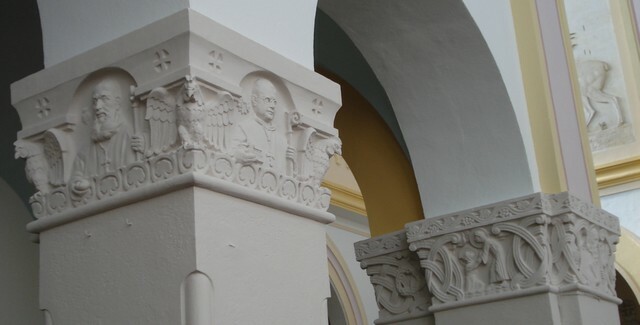 Na području župe postoje kapelice u Česmi, kapelica sv. Josipa radnika, od 1922. bila je drvena, a 1973. sagrađena je nova, koja je spaljena 1995. i nije obnovljena; u Delibašinu Selu, na groblju sv. Ive, 1905. sagrađena je drvena, poslije je podignuta nova; u Mađiru, zidana kapelica posvećena Rođenju BI. Dj. Marije, sagrađena 1936.; u Priječanima, na groblju sv. 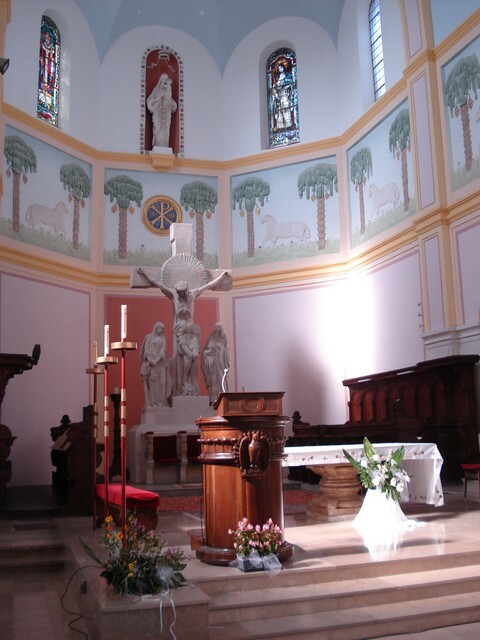 Ilije, veća kapelica, obnavljana u više navrata posljednji put 2002. Kapelica sv. Josipa radnika u Česmi posve je spaljena u srpnju 1995. i još nije obnovljena. Kapelica sv. Ilije u Priječanima na groblju oštećena je i opljačkana. Kako smo već rekli, župom upravljaju oci trapisti, a župi Marija Zvijezda pripadaju ova naselja: Budžak (dio), Česma, Krčmarice, Mađir, Priječani i Slatina. 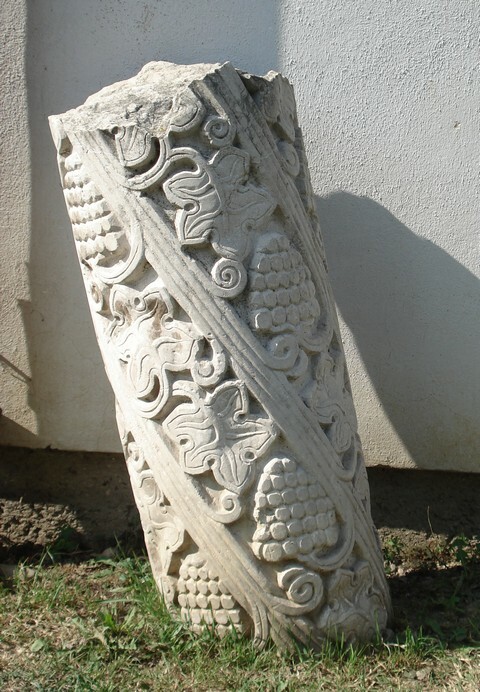 Od važnijih hrvatskih kulturnih udruga i ustanova na području današnje župe Marija Zvijezda u Delibašinu Selu djelovalo je povjerenstvo Hrvatskoga kulturnog društva Napredak od 1924. do 1926. 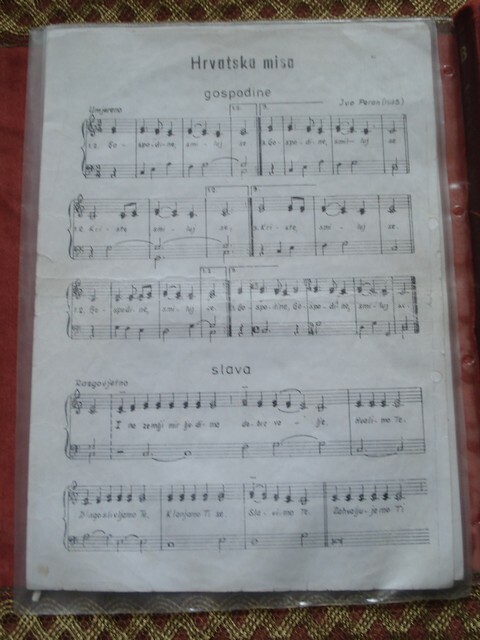 Odvajanjem pojedinih naselja od župe Marija Zvijezda utemeljena je nova župa Budžak (1983.). Broj vjernika po naseljima u župi Marija Zvijezda 1990. bio je ovakav: Budžak (356), Česma (662), Krčmarice i Slatina (51), Kumsale i Rajkovići (155), Mađir (248) i Priječani (650). Iako rata na području župe Marije Zvijezde između 1991. i 1995. nije bilo broj vjernika po naseljima drastično se smanjio zbog progona koje su provodili ekstremni Srbi, tako da je broj vjernika po naseljima 1998. bio ovakav: Budžak (86 katolika), Česma (114), Krčmarice i Slatina (22), Kumsale i Rajkovici (41), Mađir (30) i Prijecani (41). Prema podatcima od 31. prosinca 2005. župa Marija Zvijezda imala je ukupno 152 katoličke obitelji s 257 katolika. Ovakvo stanje broja katolika u župi Marija Zvijezda posljedica je njihova nasilnog iseljavanja i protjerivanja koje je predvodila ekstremna srpska politika između 1991. i 1995. te nakon toga. Izvor: Banjalučka biskupija u riječi i slici od 1881. do 2006. Prije rata [1991-1955] ovo selo imalo je 472 obitelji i 1.621 žitelja i zbog bogatstva, u kome se tada živjeli ovdašnji Hrvati, Šurkovac se iz milja zvao Mali Vatikan. U ovom selu udaljenom od Prijedora 16 km tada su 22 obitelji u kucama imali vlastita postrojenja centralnog grijanja. Danas, jedanaest godina nakon rata u Šurkovcu životari svega 210 osoba u 112 obitelji. 1991. god. župa je imala 1.258 katolika, od toga u Kalajevu 167, u Gornjem Volaru 355. 1991. - 1992. pred početak rata crkva je renovirana i postavljena su tri vitraia na temu Srca Isusova po nacrtu Ivane Ulman-Ćurilović. 3. 3. 1993. podmetanjem eksploziva dva tornja su potpuno srušena, a glavni dio crkve jako oštećen. 1995. na kraju rata bilo je oko 190 katolika u Šurkovcu.